The Northwestern University football team won without having to set foot on the gridiron. After the National Labor Relations Board in Chicago ruled that the players meet the definition of an employee, the Wildcat football team now has the right to hold a union election. Click here to read the landmark decision. Football players at the private university in Evanston, IL submitted authorization cards to the NLRB in January, citing concerns with NCAA concussion policy, student-athlete graduation rates and sports-related health coverage. “College-athletes need a players association because NCAA sports has clearly demonstrated that it will never voluntarily provide players with basic protections regardless of how many billions of dollars the players generate,” reads a statement on the College Athletes Players Association (CAPA) website. For now, the ruling only applies to student-athletes at private universities, but it’s likely to have wide-ranging impacts on college athletics and the labor movement as a whole. 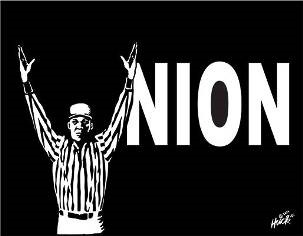 “This ruling is a tremendous victory, not just for the athletes at Northwestern, but ultimately for all college athletes, many of whom generate tens of millions of dollars each year for their institutions, yet still are in constant danger of being out on the street with one accident or injury,” said United Steelworkers President Leo Gerard.